Inevitably, everything goes wrong in spy fiction. That’s the sweetest part, the moment you’re waiting for from page one onward. Specialists go in with a plan based on limited intel, and when the whole shebang goes south, it’s time to improvise. Lana Kane jerry-rigging a car to explode as it drives into the secret spaceship silo while Dan Briggs is lifting the microfilm off the assassin impersonating Turkmenistan’s ambassador. Emma Peel jumping off a building and sailing away on her backpack hang glider as a squad of guards bear down on her. Simple, classic, awesome. The pyrotechnic stress of spy-craft blooms when secret agents act on the fly, but there needs to be a plan in the first place before it can go off the rails. Something has to go right before it can go wrong. 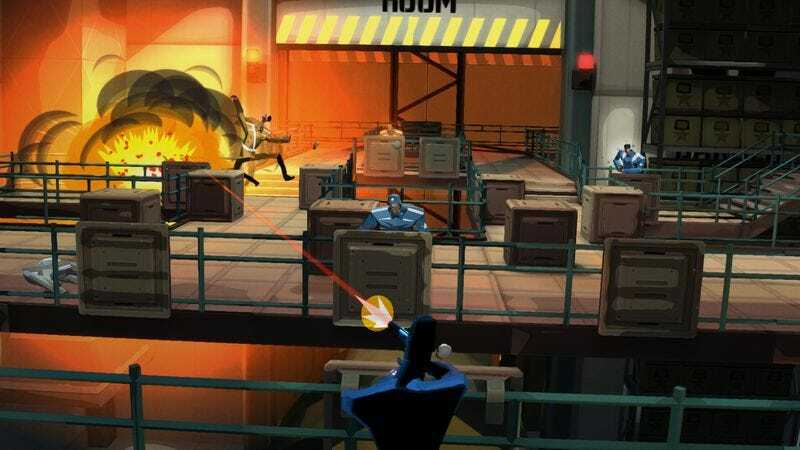 CounterSpy’s got the moves, the look, and the sound, but it doesn’t have the smarts, the tension, or the carefully crafted plans to live up to spydom’s best. Going in without a plan is built into the game’s guts, and it’s poorer for it. Painted in bold, minimalist ’60s pop-art strokes like a playable version of the Archer title sequence, CounterSpy casts you as a faceless agent of C.O.U.N.T.E.R. This ill-defined clandestine organization is a mercenary but altruistic outfit. Every mission in the game has you infiltrating installations in caricatures of either the United States or the USSR during the height of the Cold War, and you’re rewarded with cold hard cash based on your performance. The ultimate goal, though, is to collect packets of information about both superpowers’ insane plans for a nuclear strike on the moon. At first, your mission is a welcome one. The nameless spy in your control certainly looks slick—an inky shadow person whose only defining feature is the white outline of the specs sitting high on his head. Most of the time, you proceed from left to right, looking at blocky bases in profile, jumping up ladders and into air ducts, and tapping a button to silently knock out soldiers if they get close. When you take cover behind a wall to hide from patrols and cameras, the perspective shifts to a dramatic three-dimensional view. Dutch angles allow you aim your gun—you can carry up to four, in any combination of shotguns, silenced pistols, assault rifles, etc.—to quietly take foes out before they hear you and neutralize the ones lurking in the background off the linear, two-dimensional path you’re stuck walking on. There’s a staccato rhythm to CounterSpy that’s undeniably gripping at first. Each stage is just a few rooms long. Sneaking along and finding hidden alcoves with valuable intel or the files you need to swipe before your final assault feels as jazzy and smooth as the game’s post-bop soundtrack. The promise of nail-biting tension looms, too. A meter starts to fill when you’re spotted, raising that nation’s DEFCON level from a baseline of all-good 5 up to Slim-Pickens-in-Strangelove 1. If you die, it automatically rises one level until one country bombs the other. The only way to lower the DEFCON level is by purchasing a one-time-use perk before each stage to or by finding an officer and sticking him up. In theory, CounterSpy would become a harrying game of constant escalation, jumping between stages, trying to put out paranoia fires as the DEFCON meter climbs. But that never happens. The DEFCON meter is more of a nuisance than anything else, forcing you to stay in one country where you were particularly sloppy as you try to manage the DEFCON-debt while the other country stays static. Deflation of stakes is a symptom of CounterSpy’s larger lack of focus and clarity. Every level, regardless of which country you’re sneaking into, is randomly generated by the game. Rather than providing a sense of intimidation, sparking variety as in a game like Rogue Legacy, the random stages leave CounterSpy feeling stagnant and predictable. As you find more pieces of the plans to prevent a nuclear catastrophe, seemingly nothing escalates other than the soldier count. Even the final stage—which plays out in whatever country has the most pressing DEFCON level—is just a blitz of foes. Not even your arsenal feels like a growing concern, since the money you earn from each mission has to be spent on refilling ammunition rather than going toward a better kit. Unless of course, you want to replay stages for more and more cash. But nothing drains drama like a needless grind. This hazy execution affects every aspect of CounterSpy. Sometimes it feels like straight parody. The faux-United States stages are littered with over-the-top propaganda screaming about how every good soldier spends money and makes way for “VICTORY!” Meanwhile, loading screens and menus between stages are adorned with bits of text soberly recounting the real world history of nuclear proliferation and the Cold War. Emotional whiplash is a natural result of shooting a score of soldiers surrounded by satirical posters only to be reminded of the Russian officer who helped diffuse the Cuban missile crisis seconds later. Had it gone with a more crafted experience, zeroing in on a consistent tone and a series of clearly defined challenges, CounterSpy could have been more Three Days Of The Condor rather than This Means War. All it needed to do was remember the 7 Ps, one of the British military’s enduring adages: Proper prior planning prevents piss poor performance.